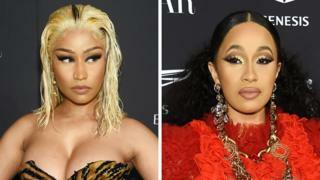 The scuffle began after rapper Cardi approached Minaj over "lies Nicki was spreading", celebrity website TMZ said. She was allegedly elbowed in the face by a security guard, before throwing a red-heeled shoe at Minaj, who appeared unscathed from the incident. Eyewitnesses told US media the altercation took place on the first floor balcony of the Harper's Bazaar ICONS party, during a performance by Christina Aguilera. The rapper, who has achieved huge success over the last year with hits such as Bodak Yellow and I Like It, said she had let a lot of things slide. Cardi did not mention Minaj by name but said, "I let you sneak diss me, I let you lie on me, I let you attempt to stop my bags". "I addressed you once in person, I addressed you a second time in person, and every time you copped a plea!!" How do stars like Cardi B juggle touring with parenthood? 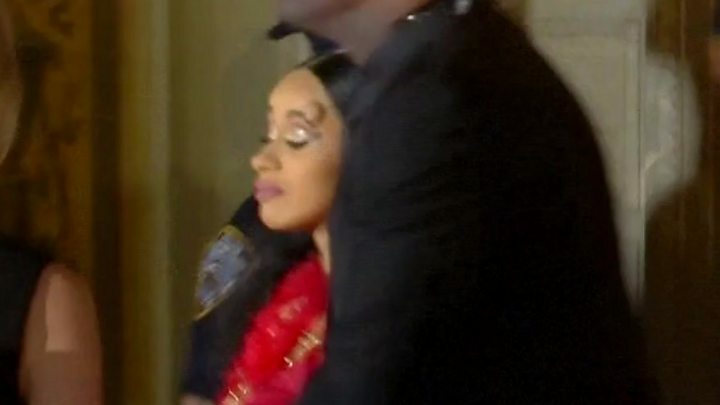 Cardi then explained: "But when you mention my child, you choose to like comments about me as a mother, make comments about my abilities to take care of my daughter" that is when the rap star said all bets are off. The 25-year-old pulled out of her tour with Bruno Mars later this year, admitting she had "underestimated this whole mommy thing". At the MTV music awards in August, Cardi B made comments that were perceived as a barb at Minaj's expense. The two rappers had previously denied there being a rift between them, despite repeated suggestion of subtle digs in each other's lyrics.